The National Geographic Society called Corcovado Park on the Osa Peninsula "the most biologically intense place on Earth in terms of biodiversity". Jacque Cousteau praised the Golfo Dulce as one of the most pristine Gulf’s in the world and one of only three tropical fjords in the world. Finca de nada is located on a private bay on the Golfo Dulce with 65 acres of jungle near the town of Rincon on the Osa Peninsula. With boat access only, finca de nada is the ideal place to relax and experience the magic of nature first-hand. 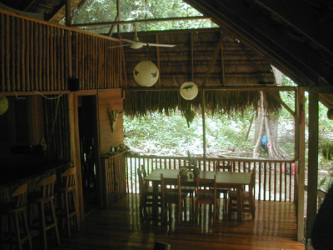 Available for rent are two open-air ranchos in the middle of the jungle that accommodate up to 10 persons very comfortably. We are powered by solar panels and small hydroelectric with gardens, kayaks, fruit trees and privacy.